ESO Supernova Exhibition — How do stars evolve? During the life of a star, heavier and heavier elements are created in the core. Once the nuclear fuel is exhausted, the star first shrinks and heats up, then swells up into a red giant. Low-mass stars end their lives as white dwarfs; massive stars explode as supernovae. 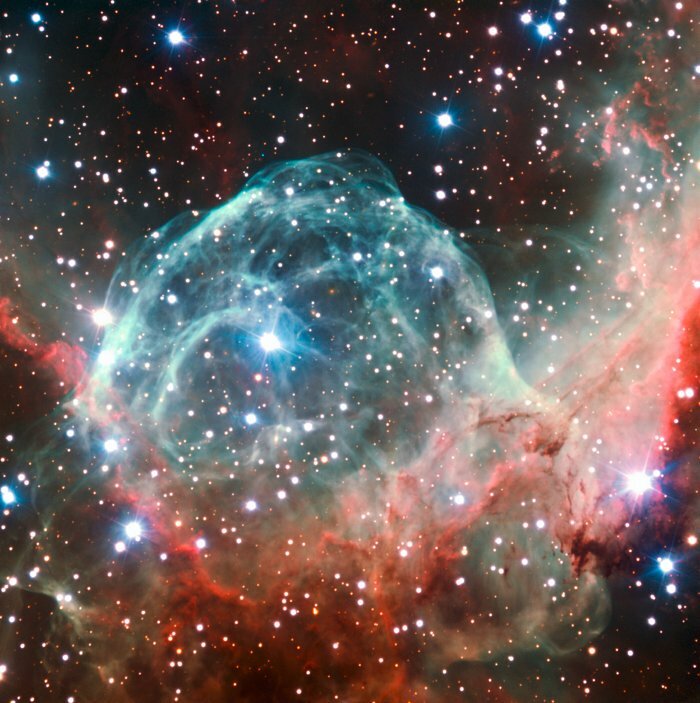 Blowing bubbles: In the Thor’s Helmet nebula, gas is blown into a bubble by the wind of a young, blue, massive star in the centre. 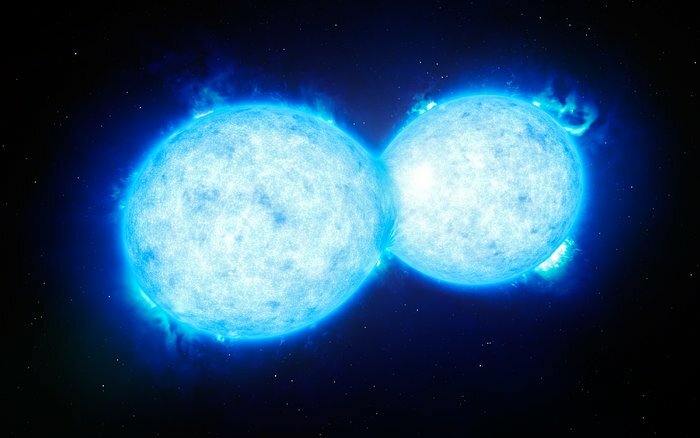 Mutual influence: Many stars are born as binaries or multiple systems. During their life together, they strongly influence each other’s evolution, especially if they are close to each other (artist‘s impression). After forming from a cloud of gas and dust, a star reaches a stable phase in which hydrogen fuses into helium in its core – it starts to shine. At later stages, other fusion reactions take place, and the star expands into a red giant or supergiant. Massive stars evolve fast and end their short lives in epic supernova explosions. Low-mass stars like our own Sun evolve much more slowly.During the red giant phase they shed their outer layers into space, while the star’s core contracts into a white dwarf. In binary systems, transfer of material from one star to the other can strongly influence the evolution of both stars. Explosive end: A massive star has blown itself apart at the end of its life in a powerful supernova explosion. The ejected material creates this colorful nebula. Credit: NASA, ESA, HEIC, and the Hubble Heritage Team STScI/AURA). Acknowledgment: Y.-H. Chu and R. M. Williams (UIUC). Just like people, stars change during their lives. But there’s a difference. Human babies weigh more or less the same. 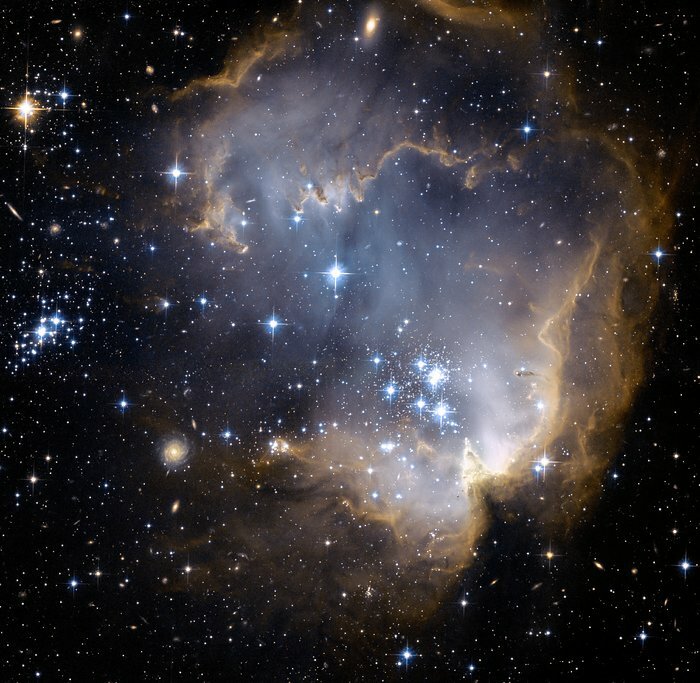 Baby stars, however, can be light or heavy. This affects how they live and evolve.